Rosneft Chairman of the Management Board Igor Sechin and Egyptian Natural Gas Holding Company (EGAS) Chairman Khaled Abd El Badee signed a Term Sheet for Rosneft future supplies of liquefied natural gas (LNG) to the Egyptian company. The document defines key terms of the future cooperation between the companies in the area of LNG supplies. 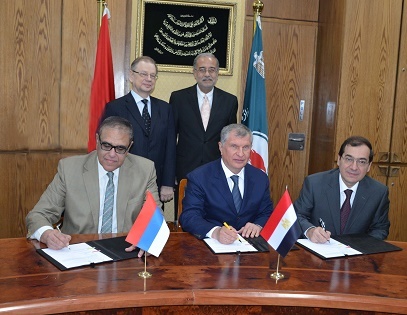 The implementation of the terms of the signed document will allow Rosneft to access the high growth potential Egyptian gas market and deepen broader cooperation between the two companies. In addition the cooperation with EGAS will allow Rosneft to strengthen its position in the global LNG trading market. Rosneft Chairman of the Management Board Igor Sechin and Egyptian General Petroleum Corporation (EGPC) General Director Tarek El-Molla signed a Term Sheet for prospective supplies of oil products and liquefied petroleum gas (LPG) delivered by Rosneft to the Egyptian company. The document, signed in continuation of agreements reached at the St. Petersburg International Economic Forum defines key terms of cooperation between the companies in the area of oil products and LPG direct supplies. Rosneft and EGPC expect binding agreements based on the agreed Term Sheet to be signed within the third quarter of 2015. Execution of the terms of the signed document will allow Rosneft to significantly expand the cooperation with Egypt and EGPC as well as strengthening Rosneft’s position as a supplier of oil product and LPG in Northern Africa. Moreover the partnership with the Egyptian company will boost Rosneft trading potential both on a regional and global scale.